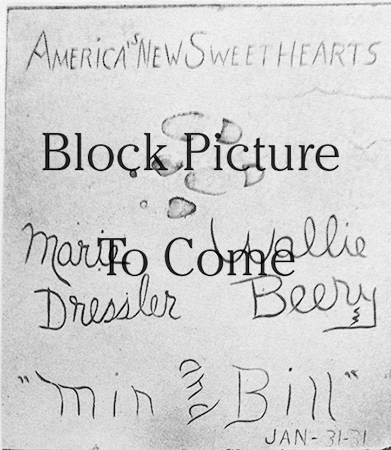 Graumanschinese.org / Footprint Honorees / Marie Dressler, Wallace Beery and "Min and Bill"
One sheet poster for Min and Bill, released on November 29, 1930. Min and Bill was the little picture that could. Produced at Metro-Goldwyn-Mayer by Harry Rapf and director George W. Hill, the film was made for a song and became a runaway hit. Based on a short story called Dark Star by Lorna Moon, Min and Bill told the story of Min, played by Marie Dressler, who runs a waterfront flophouse, as she frets over her adopted daughter who is now a young woman. 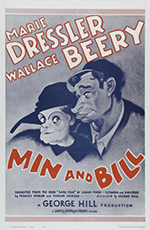 Min has a relationship with a boozy fisherman, Bill, played by Wallace Beery. Dressler won the Best Actress Oscar for her performance in this film. As was the custom, Min and Bill had its premiere in New York. The film was such a success, that it solidified Dressler's reputation as one of the sure-fire performers of the era, and did the same thing for Wallace Beery. Even though Min and Bill had not played the Chinese (it was too small a picture to be booked there really), in an unual twist, it was decided to commemorate the two performers in one block together honoring the one picture. In 1933, Metro-Goldwyn-Mayer made a sequel of sorts, called Tugboat Annie, with Dressler and Beery playing different charcaters,but the setting and tonalities were essentially the same. The picture was directed by Mervyn LeRoy, and was an even bigger hit than Min and Bill. 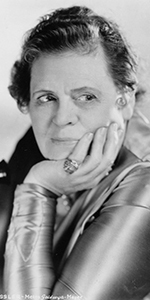 Marie Dressler was an experienced stage performer, who had great success in silent films, but was especially popular in the early sound period. Leaving home at age 14, Dressler soon learned the art of vaudeville stage comedy, becoming a gifted improvisor. Able to sing as well, Dressler appeared in light operas, taking the role of the battle-axe Katisha in The Mikado — the mind reels! Dressler made her Broadway debut in 1892. Maurice Barrymore, father of Lionel, Ethel and John, advised her to drop opera and to refine her comic skills. In 1896, she had a great success with the Broadway play The Lady Slaver, which ran for two years. In 1900, she formed her own troupe, but their tour of Miss Prinnt folded, leaving Dressler broke, forcing her to sign a contract with Weber and Fields for a three-yeard deal. In 1907, she took a show called Philopoena to London's West End, where it flopped, so Dressler was broke once more. After a few seasons of odd job performances, Dressler refined Tillie's Nightmare before it opened on Broadway, where it was a huge success in 1909. Dressler owned the rights to the play, and in 1914, she allowed Mack Sennett to adapt it as the first feature-length (78 minutes) movie comedy — Tillie's Punctured Romance (released in December, 1914). Three more Tillie movies followed, making Dressler a movie star. During World War I, Dressler toured the U.S., selling Liberty Bonds. She also entertained the American Expeditionary Forces in France. After the war, Dressler attempted to get back into pictures, but found no takers. The short travel films she made in Europe didn't come off and were shelved. She announced her intention to retire. As a sign that she was hanging it up, she published her autobiography, The Story of an Ugly Duckling, in 1924. Championed by screenwriter Frances Marion, to whom Dressler had shown much kindness to on the Tille films, Dressler made The Callahans and the Murphys at M-G-M (released in June, 1927). She returned to play Marion Davies' mother in The Patsy (released in March, 1928). Dressler has a delightful number with Polly Moran and Bessie Love in The Hollywood Revue of 1929 (which world premiered at the Chinese in June, 1929). During the run of that picture, Dressler appeared at the "Billion Dollar Midnite Matinee" late show on Saturday, July 6, 1929 in a star-studded micro version of Gus Edwards' musical School Days, along with Fanny Brice, Benny Rubin, George K. Arthur, Charles King, Bert Wheeler, Tom Patricola, Polly Moran, Lola Lane, Louise Groody, Louise Dresser. Frances Marion used her pull to have Dressler cast in a supporting role in Anna Christie (released in February, 1930), but it was Marion's script for Min and Bill which made her a household name, and for which she received an Oscar. Several hits followed: Reducing (released in January, 1931), and Politics, (released in July, 1931) and Emma (released in January, 1932), but in addition to Tugboat Annie (released in August, 1933), the summer saw Dressler in her best-known role, that of Carllotta Vance in Dinner at Eight (which premiered at the Chinese in August, 1933). Her last film was Christopher Bean (released in November, 1933). Dressler died of cancer in 1934 at the age of 65. Wallace Beery in a portrait taken for his film Old Hutch, in 1936. 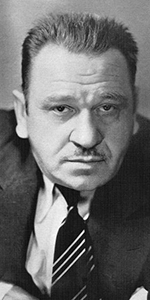 Wallace Beery had a very long and great career in films, from the silent era to the late 1940s. The man looked like a lug, but some of his performances are consumate displays of acting. Not interested in school as a child, Beery "ran away to the circus" at age 16. He gave that up after being clawed by a leopard. In 1904, Beery joined his actor brother Noah in New York, where Beery learned the technique of the stage in Summer Stock and Broadway. In 1913, Wallace Beery began his long career in movies by making His Athletic Wife (released in August, 1913) for Essanay in Chicago. Beery learned the ropes by directing himself in a string of Sweedie comedy shorts for the studio. While his marriage to Gloria Swanson didn't last, Beery's ability to play his roles skillfully did, despite his continual roistering. He rose to the top of the supporting-players list, usually playing the heavy: The Last of the Mohicans (released in November, 1920), The Four Horsemen of the Apocalypse (released in March, 1921), Douglas Fairbanks in Robin Hood (released in October, 1922), The Sea Hawk (released in June, 1924), So Big (released in December, 1924), The Lost World (released in June, 1925) and Old Ironsides (released in December, 1926). By the time Beery made his talkie debut in Beggars of Life (released in September, 1928), he was the headliner. Finding star vehicles for him was easy, considering the inherent complexity of the man: both ham-fisted and brilliant. Min and Bill was only one of a string of hits for Beery: The Big House (released in June, 1930), Billy the Kid (released in October, 1930), The Champ (which had its world premiere at the Chinese in November, 1931, and for which, Beery would recieve his Best Actor Oscar), his amazing performance in Grand Hotel (which also world premiered at the Chinese in April, 1932), Tugboat Annie (released in August, 1933), Dinner at Eight (which premiered at the Chinese in August, 1933), Viva Villa! (released in April, 1934), and Treasure Island (released in August, 1934). Beery remained a headliner at M-G-M for the rest of his life, so many of his films played at the Chinese: The Mighty Barnum in January, 1935, West Point of the Air in April, 1935, China Seas in August, 1935, O'Shaughnessy's Boy in October, 1935, Ah, Wilderness! in January, 1936, A Message to Garcia in April, 1936, Old Hutch in December, 1936, Slave Ship in June, 1937, The Bad Man of Brimstone in Janauary, 1938, Port of Seven Seas in July, 1938, Stablemates in October, 1938, Stand Up and Fight in February, 1939, Sergeant Madden in May, 1939, Thunder Afloat in September, 1939, The Man from Dakota in February, 1940, 20 Mule Team in May, 1940, Wyoming in October, 1940, The Bad Man in March, 1941, Barnacle Bill in July, 1941, The Bugle Sounds in March, 1942, Jackass Mail in August, 1942, Salute to the Marines in September, 1943, Rationing in March, 1944, and Barbary Coast Gent in October, 1944. After the M-G-M films began showing at the Egyptian down the street, Beery's star power began to wane, with perhaps Beery's best role being A Date with Judy (released in July, 1948). Beery continued to work until his fatal heart attack in 1949; he was 64. Grauman's Chinese Theatre, Hollywood, California. 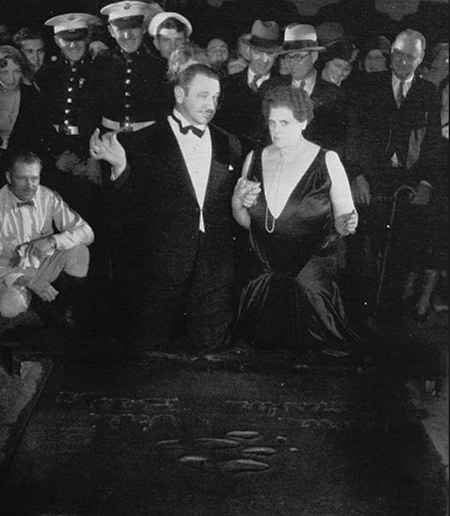 Marie Dressler and Wallace Beery footprinting ceremony, Saturday, January 31, 1931. Beery and Dressler have their imprints taken by Jean Klossner (in white on left). Grauman's Chinese Theatre, Hollywood, California. 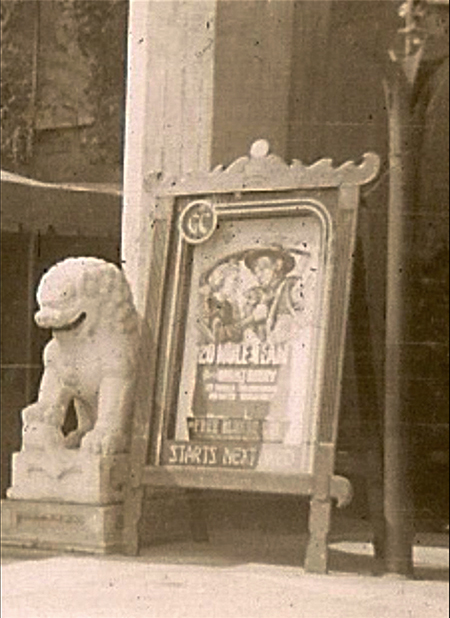 Forecourt poster case for the Wallace Beery starring picture 20 Mule Team, which will "starts next wed" meaning this photo was taken during the run of Johnny Apollo, beginning Wednesday, April 24, 1940. Photos like this are quite rare, but the Graumanschinese.org archive is deep — almost every film Beery made from 1935 to 1944 played the Chinese.